Wiring options include leads with blunt cut ends or .180 in. male bullet connector. PC rated to produce light at a 90° angle left and right of center. Buyers Products 0.75 Inch Round Marker Clearance Lights are used on trucks and trailers to meet FMVSS/CMVSS 108 regulations. The round marker lights have a single LED and are PC rated to produce light at a 90° angle left and right of center when properly mounted. 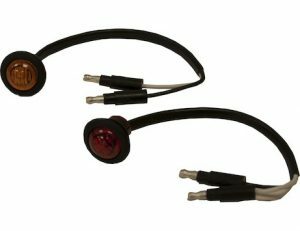 Lights are available in red or amber and mount with either blunt cut leads or .180 in. male bullet connectors. These lights are sold in bulk and backed with a limited lifetime warranty.